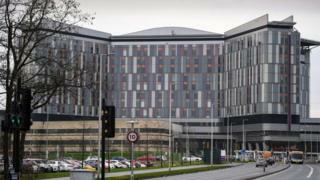 An investigation into the water supply at the Queen Elizabeth University Hospital in Glasgow found "widespread contamination", it has been confirmed. The probe was launched after an infection outbreak in two cancer wards at the neighbouring Royal Hospital for Children (RHC) last year. A report by Health Protection Scotland says contamination was found in taps and drains at both hospitals. It said work to fix the problem was ongoing. A total of 23 children contracted bloodstream infections in the cancer wards between January and September last year. The infections were thought to be linked to bacteria in the water supply at the RHC, and the two cancer wards were closed in October - with patients being moved next door to the Queen Elizabeth. In a report published on Friday, Health Protection Scotland said water testing had identified widespread contamination across the hospital campus. But it said there had been no further infections since the closure of wards 2A and 2B - which house the National Bone Marrow Transplant Unit at the children's hospital. The report said: "Between the period of 29th January and 26th September 2018, 23 cases of blood stream infections (11 different organisms) with organisms potentially linked to water contamination were identified. "As a result further testing of the water supply was undertaken across both hospital sites early in the investigation. "This testing identified widespread contamination of the water system." The report said control measures had been introduced, including sanitisation of the water supply and drains and the installation of filters in wash hand basins and showers "to ensure a safe water supply". It also said a review of water supplies across Scotland's newer hospitals should be carried out to ensure that no similar incidents happened in the future. The report added: "A number of lessons can be taken from this incident in relation to water safety and commission, handover and maintenance of buildings." A full review into the construction, design and maintenance of the Queen Elizabeth Hospital was ordered by the Scottish government after separate infection outbreaks were identified at the start of this year.